Celebrate New Year’s Eve Down Under with this ultimate experience and an unmatched view of the Sydney New Year’s Eve Midnight Fireworks. This experience is one of the most spectacular shows that takes place in the world’s best open theater – fireworks firing from barges, skyscraper rooftops and across the iconic arch of the Sydney Harbour Bridge. Stay in luxury accommodations and take part in a Sydney Harbour Bridge Climb and a tour of the city to complete this unforgettable experience. On arrival into Sydney you will be met and transferred to your accommodations. It is no surprise that when the British first arrived in Sydney they named the area Botany Bay. Even today, with a population of over 4 million people and a reputation for fun rather than flora, one is still surrounded by bush land in this bustling city. Native Waratah wind their way through the historic Rocks area, palm trees frame long stretches of pristine beach, and Eucalyptus embrace the harbors endless and beckoning bays. It is Sydney’s manmade wonders, however, that draw most visitors. The Sydney Opera House and the Sydney Harbor Bridge are the most photographed icons on the continent. Choose a Seaplane Safari experience and enjoy a bird’s eye view of the Opera House’s signature sails. Depart your Sydney hotel to discover the fabulous city of Sydney. Begin the morning traveling through the business district and shopping areas. See Darling Harbour and the vibrant China Town, then drive along Oxford Street with its trendy terrace houses and boutique fashion shops. See Centennial Park, a 220 hectare urban parkland in Eastern Sydney. Reaching the coast, you will see the beaches of Bronte, Tamarama and then on to explore the famous Bondi Beach, stopping to spend 30 minutes to walk the promenade and enjoy a coffee overlooking the beach. From Bondi, continue along the coastal drive past Macquarie Lighthouse to experience the spectacular views from the Southern Headland at the entrance to Sydney Harbour. Visit Watson’s Bay before following the harbor foreshore back into Sydney, passing some of Australia’s most exclusive waterfront suburbs where harbor mansions may be seen. Driving through Vaucluse, Double Bay and the colorful Kings Cross, continue to Woolloomooloo and see the famous Harry’s Café De Wheels. Visit Mrs Macquarie’s Chair, and return to the CBD via Saint Mary’s Cathedral, Historic Convict buildings, State Parliament House and the historical Rocks district. Next, cross the spectacular Sydney Harbour Bridge to head for a 2-course lunch in a harborside restaurant – soup or salad then a main course selection. 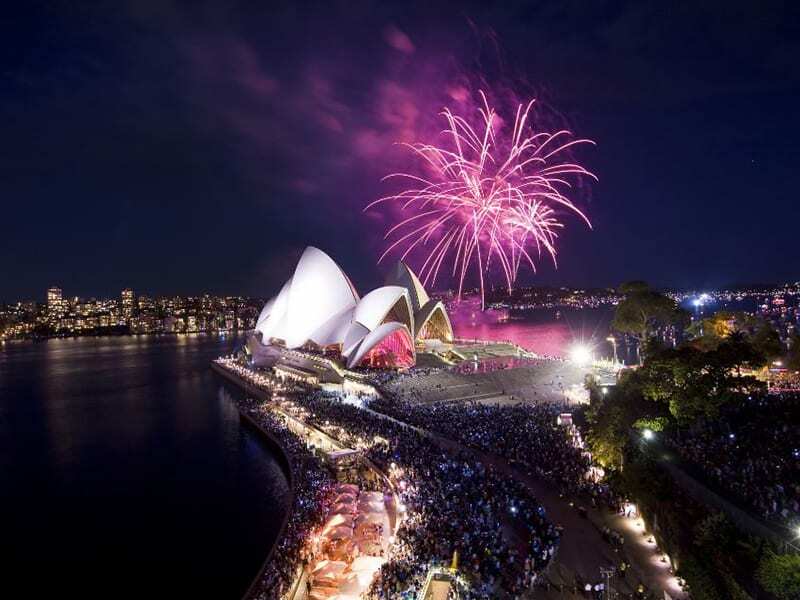 Tonight you will experience one of the most incredible sights in the world, New Year’s Eve on the Sydney Harbour. It takes fifteen months of planning to develop the world’s greatest pyrotechnic display; Sydney’s Midnight Fireworks. Come and celebrate New Year’s Eve aboard the Magistic II, a luxurious Motor Yacht, and experience what it is like to cruise like a local on one of the most spectacular harbors in the world, with your personal friendly Australian hosts. The yacht starts off with a leisurely cruise until the captain brings you to the perfect area to drop anchor. While cruising, a gourmet Australian buffet dinner is served with regional wines and local beers. Enjoy drinks and dining, and come 9:00 pm, the Family Fireworks show begins over the Opera House and Harbour Bridge. The fireworks simply light up the Harbour – it is truly incredible. Beautifully choreographed, the fireworks fire from barges around Sydney Harbour coupled with plenty of special pyrotechnic effects. After the family fireworks show, the Harbour of Light Parade puts on an exciting visual as a lead up to the world’s most famous fireworks’ display. With champagne in hand, and fifteen months of preparation, the countdown begins for the world-famous Sydney Harbour Firework show at midnight, to welcome to New Year! See the Harbour Bridge up close and personal by climbing the metal monolith and enjoy stunning 360 degree views of the glittering vista below with BridgeClimb as you climb to the top. Whether it is an early morning visit to the largest fish market in the southern hemisphere or your very first surfing lesson on Bondi Beach, in this vibrant metropolis you will find no lack of energetic escapes and dynamic distractions. There are many ways to enjoy the harbor; on a small luxury motor cruiser or sailing yacht, to ferries that take you to Taronga Park Zoo or Manly, and the harbor suburbs. Take the Darling Harbour Rocket that connects Circular Quay to Darling Harbour where there are many restaurants, attractions such as The Sydney Aquarium, Wildlife World, The IMAX theatre and the Naval Museum. For a more leisurely afternoon, take a walk through the Royal Botanical Gardens and Hyde Park, or learn about Australia’s National Gemstone, the Opal, at Altmann & Cherny or The National Opal Collection, right in the heart of the city on Pitt Street. The Bridge Climb is a 3.5 hour guided journey to the top of the Sydney Harbour Bridge. It takes you along the outer arch of the Bridge on catwalks and ladders all the way to the summit, 400 feet above Sydney Harbour. In Climb groups of up to 14 people, you’ll be led by one of Bridge Climb’s professional Climb Leaders on an adventure of the world’s most recognizable bridge. The steady incline to the summit leaves you free to focus your attention on your Sydney experience, with opportunities to witness 360 degree views of Sydney, including east to the Sydney Opera House, west to the Blue Mountains and the Harbour city surrounds. When you reach the top you will have a sense of achievement that you will remember forever – you’ve conquered an Australian icon recognized the world over. You will be transferred by private vehicle from your city accommodation to Sydney Airport.